Alarm Secure® Ltd, offer security system installations which are installed then monitored by Montronics ARC (Alarm Receiving Center) Our Five Diamond Certified Alarm Response Center provides reliable and uninterrupted security monitoring for burglary, fire, carbon monoxide, and medical emergencies. We consistently meet or exceed all UL, National Fire Protection Association, and Central Station Alarm Association standards. Alarm Secure and the Paradise Police Share a cup of coffee with one of our local Security experts and see how our solutions can Help Keep You Safe and save you money at the same time, adding up the cost of a break in, or fire is far more than the cost of our systems, not to mention peace of mind. • Secure Home Control Automation can save on average $1500 per year on energy costs and reduce carbon blueprint. • Comprehensive training programs – designed to provide the information, tools, experiences and counsel. Off-site classes on the sales process, customer relations, territory management and more – Online programs – Accompany experienced sales reps on sales calls – Ride-along with experienced sales professionals, technicians and installers – Reading materials on the industry, and our services – Mentor support to provide counsel and support – Quarterly consultations and coaching rides • On-going sales training courses • Over 100,000 installations across America. Home Security Systems (including Fire and Life Safety) (Alarm Secure Free®) 6 point system, GoControl Panel Keypad, 3 door contacts, 1 Motion detector, 1 remote control key fob, yard signs, professional installation. Both Home owners and Small businesse﻿s have very specific concerns when it comes to security. That's why Alarm Secure offers a complete range of products and services that are tailored to meet the needs of all customers. 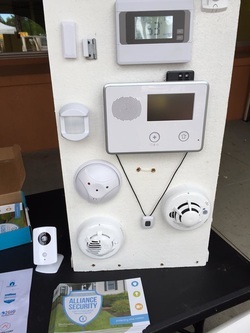 Alarm Secure can help protect your home, family and business with the following solutions developed for safe-guarding your family home or managing your business investment - while providing you with peace of mind. The Secure Vision® surveillance system is a high-quality expandable solution that can help you secure assets, decrease liability and improve employee productivity. It helps protect against shoplifting, vandalism and internal theft and may also reduce fraudulent liability claims. Alarm can help improve business operations and increase net profits.